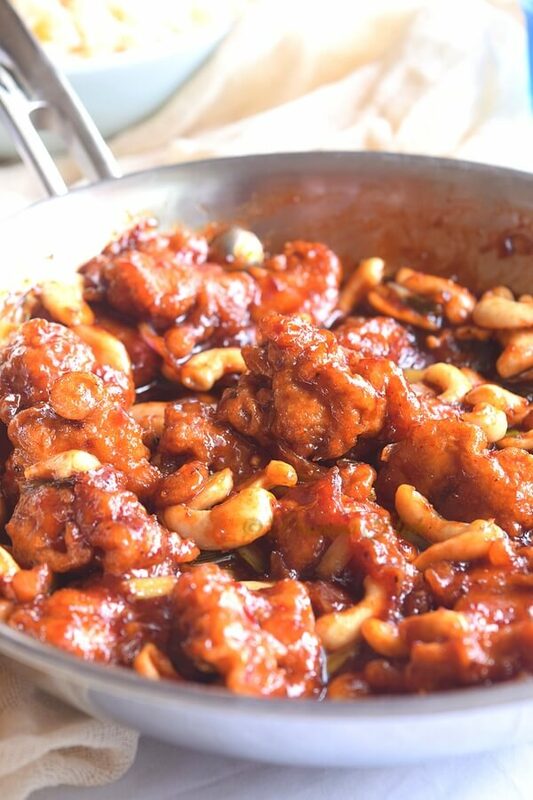 Delicious restaurant style dragon chicken,with lots of cashew nuts,simple sauces and easy to put together recipe-all under 30 mins! 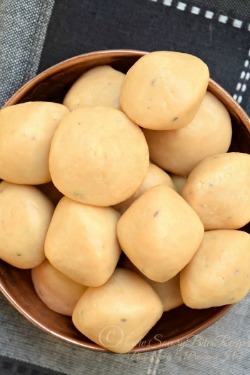 A new post after a while and this time I am sharing a recipe that is so close to my heart that too for some crazy reasons! Oh I have so fond memories attached to this dish - nothing with my family or mom's cooking! but I was so crazy for this dish once upon a time and I still am! There was this new Indo-Chinese restaurant which had opened near my apartment and word of mouth was that they serve very delicious food there! 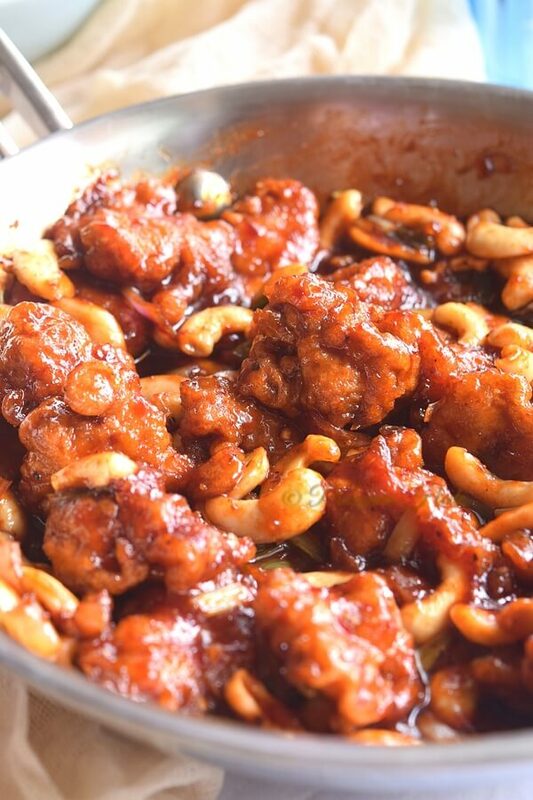 I happened to visit the restaurant once and ordered few dishes, one among them was this Dragon Chicken, and that was the first time I tried it.And I must say it was totally different experience for me,I had tasted so called Dragon Chicken in many restaurant's later but this kind of preparation was making me visit them every week! The staff of the restaurant started knowing my family so well as we used to go there every week 😂.My husband was a bit angry as I was not interested in trying another restaurant but somehow the restaurant stopped making much business and they closed down. Finally I gave up on looking on restaurants and thought of making my own,but had to make some experiments before finally making the perfect one! If you liked my recipe and would love to try then save it too! Here is the image to Pin it for further use! Marinate cleaned and cut chicken with all the ingredients mentioned. In a heavy bottom pan,add oil and when its hot,deep fry the chicken pieces. Drain them on kitchen towel . Soak red chili in water as mentioned. In a mixer grinder,grind all the ingredients mentioned for sauce. In a pan add little oil,add onion,garlic,ginger,spring onion,cashewnuts,salt and toss well. When the vegetables have cooked yet crunchy, then add chicken fried and sauce mix. 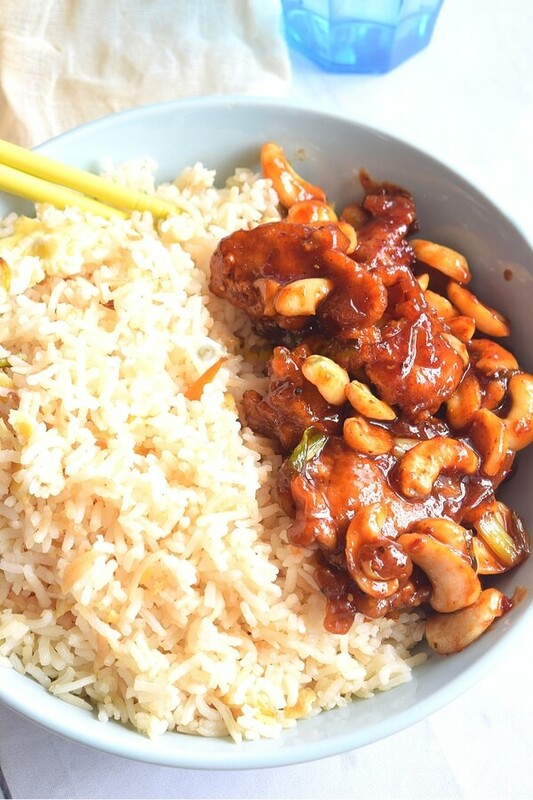 Serve hot with egg fried rice. Always keep the fried chicken separate,and when you are about to serve,then cook the vegetables and add chicken,cook and serve. Spice level can be adjusted as per individual preference. This recipe might be spicy for some,so adjust the chili/peppercorns accordingly. Note:This post contains affiliate links. This looks so delicious, love the name of it too! This looks so saucy and delicious! 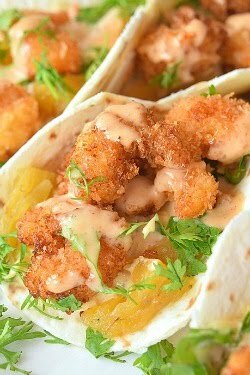 I'm pescetarian, and I'm eager to try this with shrimp! I've never heard of dragon chicken but that sauce looks amazing! 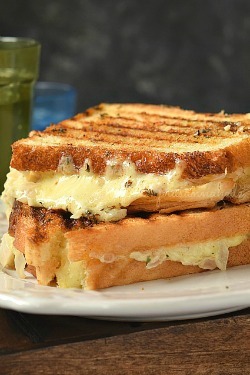 I bet I could sub tofu or veggies and still devour this! 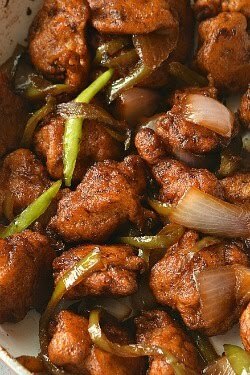 I have never heard of Dragon Chicken, but I like the flavors happening here, and while my husband would enjoy the chicken, I'd make it vegetarian for me. My kids love chicken like this and I am always nervous about trying it at home. You make it look easy and delicious! Mmmm. That looks so delicious! Don't you just hate when they close down a much beloved restaurant? I'm like you, If I find a place I like, I want to go there all the time. I can't wait to try your recipe! This looks so good! There's something so satisfying about being able to have a favorite restaurant dish at home. YUM! 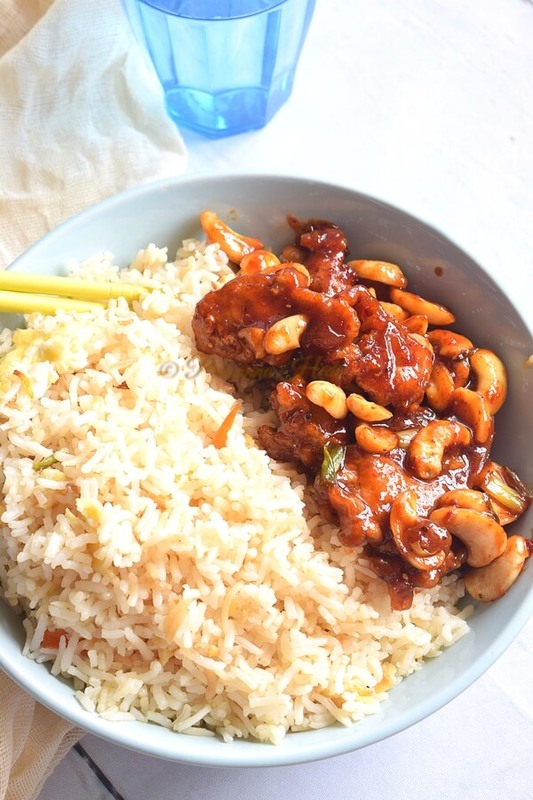 I looooove adding nuts to chinese dishes! So good! I don't think I've ever had Dragon Chicken, but it looks like a dish I would love! 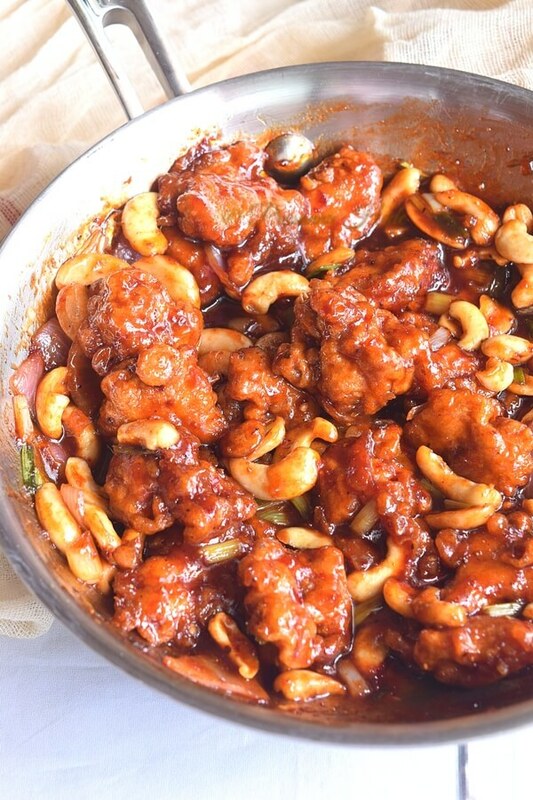 That sauce is so gorgeously glossy, and I love the addition of cashews! We are always looking for new ways to make chicken and this recipe looks like a winner to me! Can't wait to try it, thanks for sharing! Yum! Such an appetizing dinner recipe which my whole family will love. 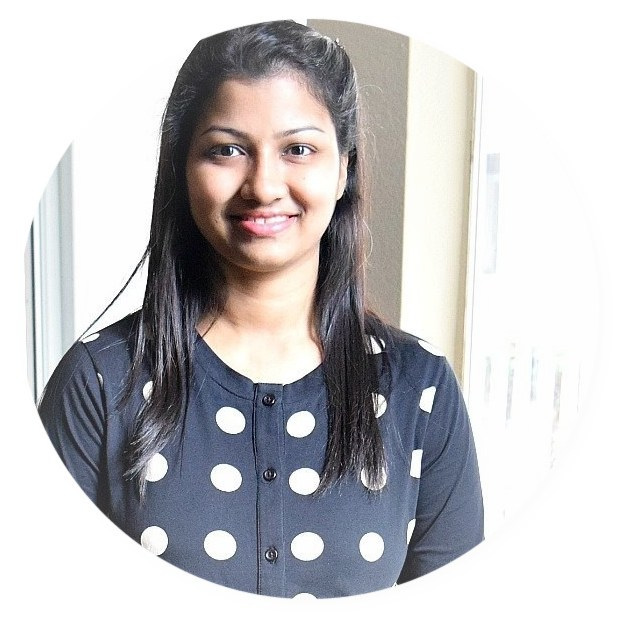 Thanks for giving me a great dish idea for our next family gathering, Prasanna! Is there any alternative to using soy sauce? This looks absolutely amazing! I wish I could reach in with my fork! Hey , I am Prasanna! I will be the first one to admit that I am an accidental food blogger.I love trying out new recipes and giving them a twist of my own. Thank you for reading this little space of mine and please extend your continuous support for more years to come!